I bought a new toy today. Actually, a couple of male members of my family has been bugging me to get it as I hadn't gotten around to it. I finally did today and I got to use it not once, not twice, but three times. About a year and a half ago, Sammy decided he wanted his hair shaved. Rather than take him to the local kids hair salon, I pulled out my husband's beard trimmer. It's the same thing only smaller, right? Not really. My husband's poor rechargeable trimmer just couldn't hack cutting a full head of hair. It took several hours and three recharges to get it done. We continued using the beard trimmer for a while. And then we let it grow out a little. Then one day he wanted it short again but I didn't want to spend several hours messing it with so I made him an appointment at the local place. We arrived at the kids' salon at the appointed time. Five minutes and $25 later, we left without his hair. I got to thinking and realized that two haircuts would cover the price of hair trimmers. I suggested it to my husband and they've been bugging to get around to visiting the beauty supply store every since. Today I did. 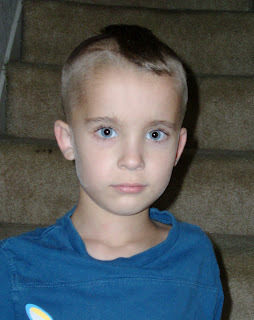 Here's Sammy sporting a concerned look at the off-centered mohawk I secretly cutting into his hair. It's hard to cut a mohawk into hair that has a cowlick right in the way so it is curling even further off center. In the end, he ended up with exactly what he wanted: a shaved head with about 1/8th of an inch of hair left. Then Scott showed amazing amounts of trust and sat in the chair. His hair isn't as short as Sammy's, though. Then Josh was instantly transformed from baby to big boy with his first hair cut. He wasn't thrilled with the idea but he survived it without making it too hard. With just these three hair cuts, we've already paid for the clippers. Hooray! oh my gosh, he really does look like a bog by. I hope you're feeling well, they all look great.